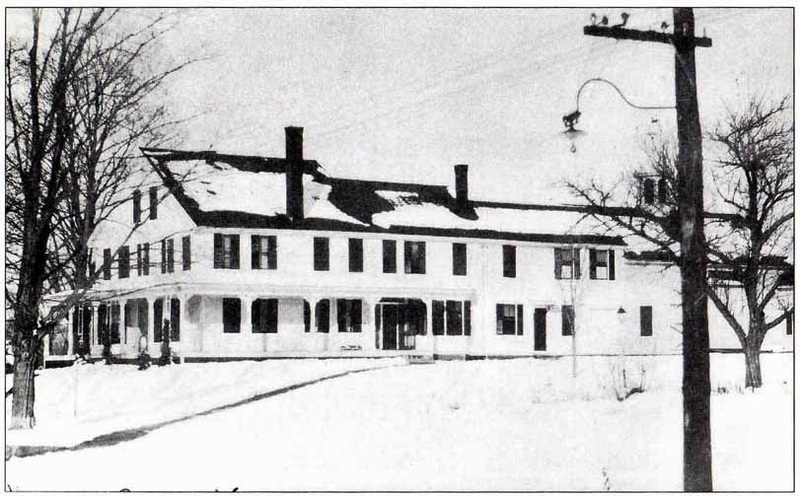 The Bridges Inn is located in a house built by the Whitcomb family, on a site originally settled by the Strattons. 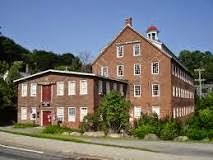 It is of a distinct style, only found in New England, where there was a high-concentration of Yankee farmers. We might call it an extended or connected house, while historian Thomas Hubka refers to it as, "Big house, little house, back house, barn". In the above picture, there are four different pitches on the roof, representing what is likely four phases of construction. The barn is visible with the two garage doors and a flag, followed by the back house, which ends at the bay window (popular during the late nineteenth century). The little house, employing Hubka's terminology, would include the bay window and the three windows above it. 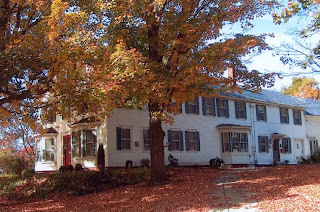 Finally, in the front of the house facing Main Street, we find the original Stratton residence. Also visible in old photos of the house is a wrap-around porch that was removed about a half century ago. Proceeding with a mixture of observation, guess work, and Hubka's research, we will take a look at how this unique house came into being. 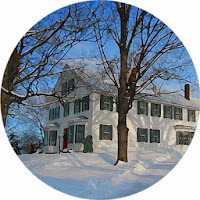 The Whitcombs purchased the house in 1841, which at that time, may have been a typical cape, as in Cape Cod-style home, two rooms wide and one room deep, called by Hubka a hall-and-parlor house. It is typical for that style of house to be built as a single story. When the family could afford it, they would jack up the cape and build an entire first floor beneath the original home, sometimes with a lavish wrap-around porch, seen in the black and white photo below. Looking at the photographs, we can clearly see that the front part of the house has a granite foundation, while the second part of the house, near the bay window, changes over to a brick foundation. I conclude that the the Strattons built the granite part, while the Whitcombs constructed the parts of the house built on a brick foundation. After purchasing the property, the Whitcombs, being Whitcombs, built an entire house attached to the original home. This 1841 demarcation runs approximately up from the window in the center of the photograph below, where a door used to be. Looking at this old photograph (below), a prominent door existed next to the bay window. This corresponds to the style that Hubka calls a center-chimney house. If there was a center chimney, it would have been right in front of the side door next to the bay window. Yankee farmers were nostalgic for their fireplaces and reluctant to give them up. The mantle and a roaring fire are all very romantic. 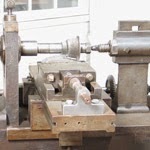 However, they are also quite drafty and waste heat, burning wood inefficiently. 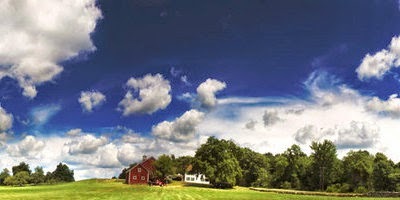 Hubka reports that beginning in the 1840's, New England farmers made the move towards wood stoves. Many farmers built what is called a summer kitchen, a room for the stove, which was used year-round despite the name. In the picture above, the old wood stove can be seen, as well as where its chimney used to connect to the wall. In the background are the stairs that would have been immediately in front of the side door (now gone). These stairs are steeper and more narrow than the other set of stairs, in the front of the house, which makes me wonder if these stairs were built after a chimney was removed. The black and white photo above shows two chimneys, one for the wood-powered cooking stove and one for the boiler in the basement, to produce steam heat. Prior to that, if there was a central chimney, it would have been where the staircase is, in the photo above. The summer kitchen may have been built sometime after the Whitcombs moved in. It is included in what Hubka calls the back house. He says that after the 1830's, New England farmers could not compete with agricultural products shipped down the Erie Canal from Ohio River valley farmers. Struggling to survive, they became involved in home industry, especially during the winter months. In the back house, which we call the tea room at the Bridges Inn, yankee farmers may have processed food, carved trinkets, and produced items for sale, such as wooden chairs and tool handles. Finally there is the barn, beginning with the sign (at the left of the flag) until the end; radiators installed in the barn indicate that the barn was once heated. The garage doors may have been built for carriages. The short, wide windows would have been just right to slide down bale of hay, to eagerly awaiting horses. 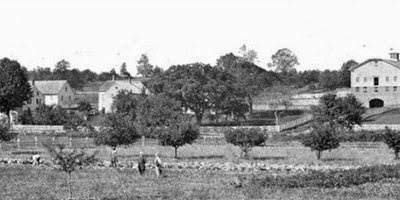 New England farms struggled through the nineteenth century, until the advent of refrigerated railroad cars created the dairy market and brought financial stability to the farmers. At that point, however, it may have been too late. 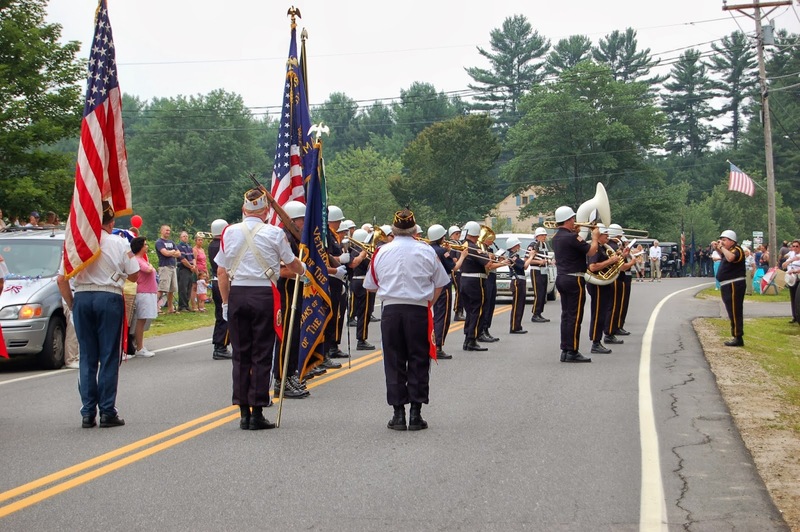 Many New Englanders left home for the promises of the West, and many New England towns celebrated Old Home Days to invite their children back from the cities. 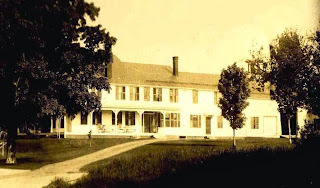 The Whitcomb House may be unique in that it was never a working farm. The railroad came through West Swanzey, so products were produced for the market. The Whitcombs owned some land and had access to trees, allowing them access to plenty of lumber. They produced buckets and other containers, before the age of corrugated cardboard, shipping them on the railroad. The ruins of their factory can still be seen down Prospect Street, beyond the Inn, with a prominent smokestack, protruding from what must have been a foundry (to make nails for the buckets). 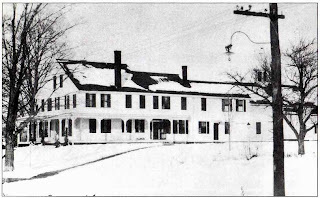 The house stayed in the Whitcomb family until after Edna Whitcomb's death in 1961. By then, most of the construction was completed. For about thirty years, private families lived here. Then in the nineties, the Munsons converted the home into a bed and breakfast. 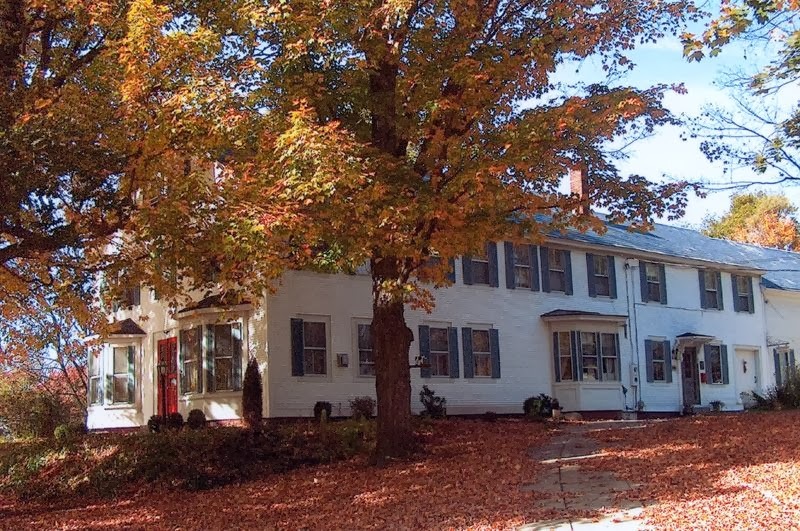 They sold the property in 2001, and in 2006, the current innkeepers bought the historic property. This region of southwestern New Hampshire is also known as the Monadnock Region and Cheshire County. Whatever you call it, you have to appreciate its colors at this time of year. Although heavy rain and wind took down several leaves earlier this week, this area is still filled with an array of beautiful autumn colors. Below are some photos of this region, some compiled from facebook postings, with credit given to the photographers. 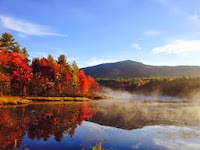 The State of New Hampshire has a website listing events and scenic places throughout the state http://www.visitnh.gov/4-seasons/fall-harvest/default.aspx. 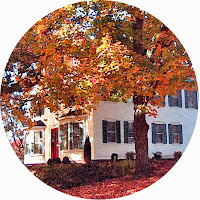 We're fairly booked at the Bridges Inn at Whitcomb House for October. Most of our availability at this point is during the week. If you can't make it to New Hampshire during October, we think this region is beautiful at most any time of the year. Round images by Suerae Stein of Red Barn Artworks - they are for sale as ceramic ornaments at the Bridges Inn at Whitcomb House. 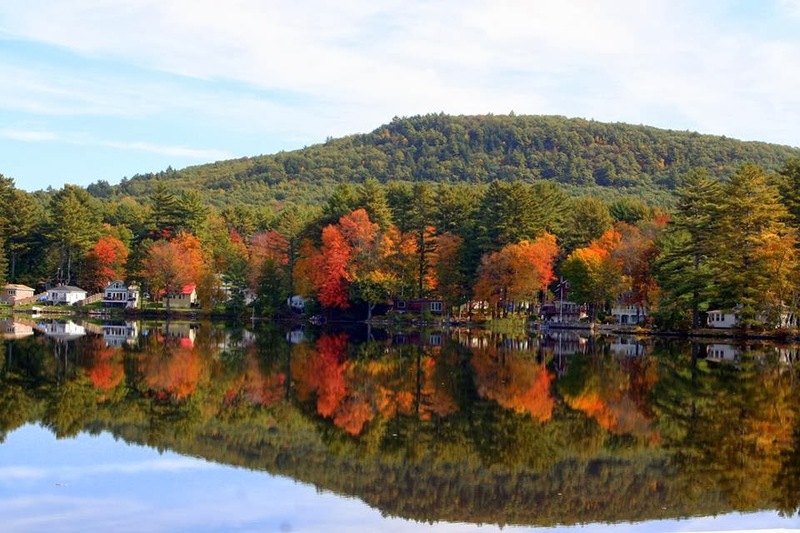 Visitors to the Monadnock region have commented that each small town is unique. Each town has its own flavor, so it's not any great leap to say that Keene is different from Peterborough. 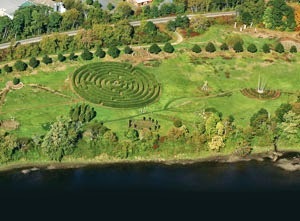 While both towns are in southwestern New Hampshire and only about eighteen miles apart, each has a distinct character. It is the result of the people who live there and the culture they have created over the years. Large and long-lasting institutions also tend to influence local character. 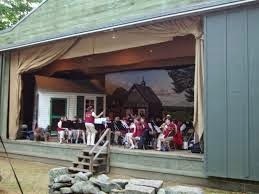 In Keene, for instance, the local college, Keene State, contributes greatly to the arts and culture. In Peterborough, however, the influence is a little more subtle. 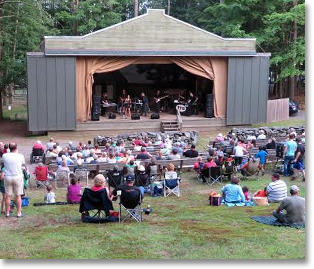 Visitors will immediately notice that the small town has a rich culture of arts, such as the Peterborough Players professional theater. Harder to see is the MacDowell Colony (shown below) which is only open to the public one day out of the year. Sunday August 11th was that day this year, in 2013. The Colony opened its doors to let the public visit the grounds, meet the artists, and experience their work. There are several small cabins in the woods that are made available to qualifying artists for short periods of time. 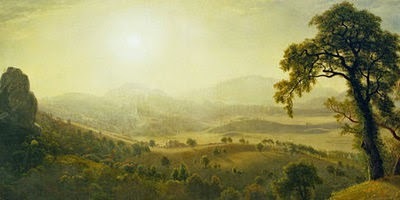 With their needs taken care of, in a forest setting, the artists can then focus on their work. The winner of this year's Edward MacDowell Medal was composer and lyricist Stephen Sondheim. The Colony is out in the woods, not too far from the center of town, but you'd never know it's there. You would, nonetheless, be aware of its influence. Peterborough has some great places for the arts. Check out the Sharon Arts Center that supports and serves artists and craftspeople, and to engage the community in the artistic process. There is also the Mariposa Museum of folk art and native culture that will delight people of all ages. 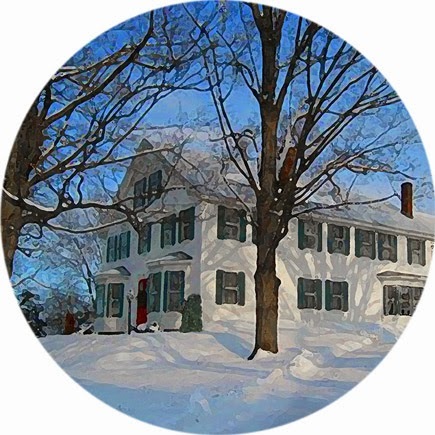 The Monadnock Center for History and Culture at the Peterborough Historical Society will give you a glimpse of the history and culture of this region. Monadnock Music offers a variety of musical performances such as chamber music, opera, and vocal and piano soloists at a number of venues in Peterborough and other nearby communities. 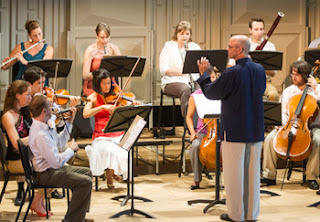 Shown below is Gil Rose conducting Monadnock Sinfonietta. While visiting Peterborough, you'll find eateries, restaurants, bookstores, gift shops, outdoor activities, and much more to make your experience more complete and memorable. However, because the focus of this blog is on the arts, we are not attempting to cover everything that's great about Peterborough. We would encourage guests of the Bridges Inn to plan a day to explore this great small town, along with some of the others in the vicinity. 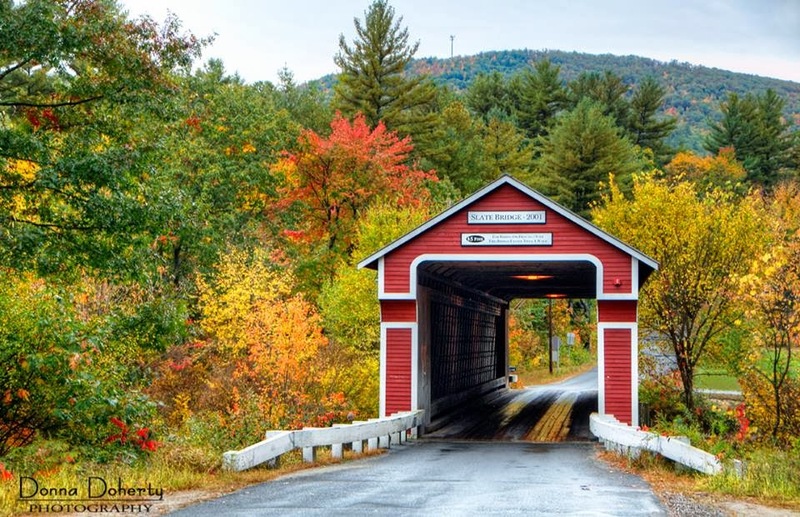 Experience for yourself the nuances in local character and culture, and see if you think these two neighboring towns in southwestern New Hampshire have their own personality. Any building as big and old as the Whitcomb House, which was built in 1792, is always going to need something. When Susan bought it in November 2006, she knew there would be projects ahead, but what a journey it has been! We have done extensive landscaping, repairs to the slate roof, painting inside and out, ceiling and floor repairs/replacement, a new bolier (furnace), plumbing enhancements, electrical upgrades, re-wallpapering the double parlor, and the list goes on. A winter project involved washing and repairing windows of which we have about 60! 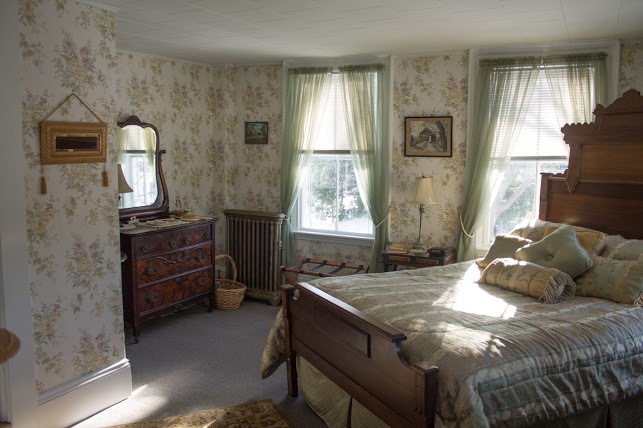 In the Coombs Bridge Room, in addition to repairs to the windows -- replacing glass, repairing wooden frames and sashes -- we hung new wallpaper. The general consensus is that the room is cheerier now. Our guests love the light﻿, welcoming appearance! Cozy wicker table and chairs with coffe maker, complimentary bottled water, chocolates, etc. This is not new; just looks more inviting! Consider a stay in the Coombs Bridge Room. All our rooms and rates can be found on our website. Today it looks and feels like spring has arrived in the Monadnock Region. Green grass is poking up from the soil and buds are starting to form on the trees. Flowers are blooming and the hours of daylight are longer. As of this weekend, this new Magnolia tree adorns the main entrance to the Bridges Inn. 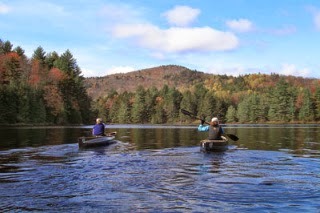 Today is also Earth Day, not just in the Monadnock Region but all around the world. According to the Earth Day Network, "Every year on April 22, more than one billion people take part in Earth Day. Across the globe, individuals, communities, organizations, and governments acknowledge the amazing planet we call home and take action to protect it." Most of us cannot do much to stop global warming and climate change but everyone can do his or her part to protect the Earth's natural resources; to conserve and preserve our environment; and to otherwise make a positive impact. 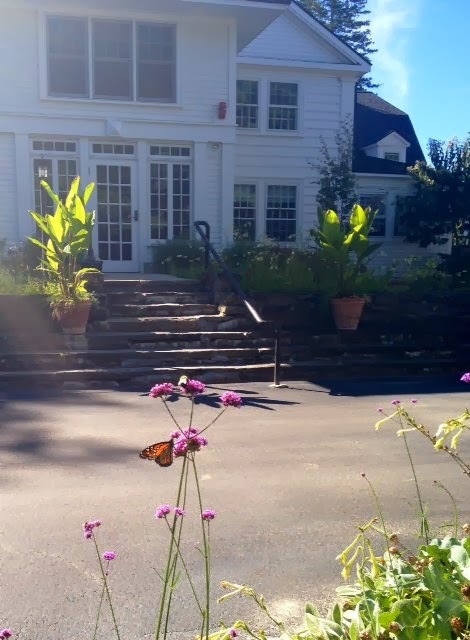 We try to keep the inn as “green” as possible by recycling, composting, purchasing environmentally friendly supplies, organic coffee, and other organic / natural food products, and doing what we can to keep us environmentally responsible and conscientious. We treasure the beauty of our surroundings. We planted a Magnolia over the weekend, with help from Maple Hill Nursery. Digging a hole - note several rhododendrons in the foreground, which have since been planted out back where the "waterfalls" were. We converted our "waterfalls" into a garden with rhododendrons. This year we've seen many of the ordinary signs of spring at the Bridges Inn at Whitcomb House: maple trees being tapped for syrup, snowdrop flowers poking through the soil, and crocuses. Spring has sprung but on Friday, April 12th, Mother Nature seemed a bit confused, dumping freezing rain and snow on the Monadnock Region. The accumulation wasn't much, but it can be seen amidst the crocuses and near the house (below). Nine days before, the snowdrop flowers had bloomed (photos taken April 3rd). Snowdrops and maple buckets always bring a smile to my face. The maple buckets shown below were taken pre-spring (on March 2nd). We were told that it was a good year for maple syrup producers. 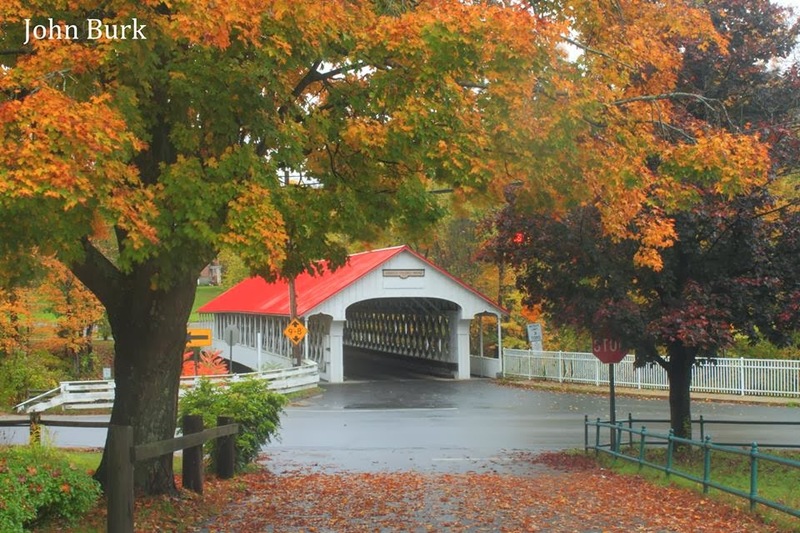 ﻿Regardless of what Mother Nature is doing, we think you'll find the Bridges Inn pleasant and comfortable. And you'll love our breakfasts. We'll be sure to serve pancakes or waffles with fresh maple syrup if you stay with us. NOTE: Double-click on the photos to open an enlarged version.